Very few people will be buying a ticket for this new screen version of The Producers without any prior knowledge of the Mel Brooks comedy classic. If they haven’t seen the hilarious 1968 film which marked Brooks’ directorial debut, then perhaps they will have been fortunate enough to see the stage musical which has been a roaring success on Broadway and in London. Having seen both the stage and screen version, I was curious to know what a third interpretation of this tale could possibly offer that would make its existence worthwhile. Unfortunately it’s clear from very early on that this effort has little of the first film’s inspiration, and not much of the musical’s boundless energy has managed to make the leap from stage to screen either. In fact it soon becomes obvious that this film is sorely lacking in almost every department. How on earth can somebody make such a mess of The Producers? The central conceit is comic gold, the ultimate bad-taste gag. Max Bialystock (Nathan Lane) is a down-on-his-luck Broadway producer licking his wounds after yet another of his productions has failed to run past the opening night. Enter Leo Bloom (Matthew Broderick), a nervy, uptight accountant who has been sent to have a look at the almost bankrupt producer’s books. While examining the figures, Leo throws out an odd observation which is immediately seized upon by Bialystock as a quick escape route from his financial woes. Bloom notices that a producer could feasibly make more money by producing a guaranteed flop than a hit, which is music to the sleazy Max’s ears. Max puts together a cunning plan. He and Leo find the worst play ever written; Springtime For Hitler, a musical romp penned by an insane neo-Nazi (Will Ferrell), and they hire the worst theatrical director they can possibly find (Gary Beach). Max raises $2 million by sweet-talking a bunch of rich and randy little old ladies and the ploy seems faultless, until their dreadful play is taken for a satire and becomes an unexpected smash. This plot is so silly and ingenious that, like Max’s plan, it seems impossible that it could fail as miserably as it does here. This film opens things out by making Swedish secretary Ulla (Uma Thurman) a love interest for Bloom and by beefing up the role of the show’s director Roger De Bris, but while these additions weren’t a problem on stage they make the 2005 film of The Producers a flabby and overlong affair. The main problem lies with the decision to let the director of the stage show, Susan Stroman, handle things here too. Without any previous film work to her name and seemingly lacking in any grasp of cinematic language, Stroman makes little attempt to alter the show for the new medium. Her approach seem to consist of pointing a camera at the same sets from the stage show and letting the actors get on with, in the belief that what wowed a theatre audience will work just as well on the silver screen. There is a brief attempt to expand the film’s horizons by taking the action into Central Park during the ‘We Can Do It’ number, but other than that this is probably the most unadventurous adaptation of a stage show that I’ve ever seen. Stroman, Brooks and Brooks’ fellow screenwriter Thomas Meehan seem to believe that changing lines like “Why does Bloom move so far stage left?” to “why does Bloom move so far camera right?” is enough to translate the show from one format to another. It isn’t enough. The film looks cheap, with two cinematographers somehow conspiring to make the visuals utterly drab and lifeless throughout, and the musical numbers fail to dazzle as they should. The editing takes a beat after every supposed show-stopper, as if to appreciate the applause coming from the paying public, but when none is forthcoming we are left with a clumsily paced and leaden film which spreads itself lugubriously over a painful 134 minutes. The major selling point of this film will obviously be the opportunity to see the two actors who made it such a smash on Broadway, Nathan Lane and Matthew Broderick. Lane is passable as Bialystock, but his performance is another aspect of the film that hasn’t altered in translation and he projects everything to the back of the second balcony. Having said that, his turn is an acting master class compared with Matthew Broderick’s performance. Broderick is simply terrible in this; he spends the entire film with a pained expression and an odd, whiney voice which changes pitch at will. Their misbalanced double act makes one pine for the fine-tuned brilliance of Zero Mostel and Gene Wilder in Brooks’ original. Elsewhere in the cast Gary Beach and Roger Bart manage to make the most of flamboyantly gay stereotypes which were borderline tiresome in 1968, while the two big names added to the cast bring little to the party. Will Ferrell overplays his hand in irritating fashion as Franz Liebkind and Uma Thurman (not much of a dancer, not much of a singer) is miscast as Swedish bimbo Ulla. But perhaps the most damning indictment one can level at The Producers is to point out the complete lack of laughs on offer. Every wisecrack dies as soon as it leaves the actors' lips and their incessant clowning quickly palls. The one part of the film which survives the butchering on display elsewhere is the centrepiece Springtime for Hitler, a slice of comic genius which still provokes laughter today. However, if that’s the one thing of value in this excruciating affair then why bother with the imitation when you can rent the original at a fraction of the price? 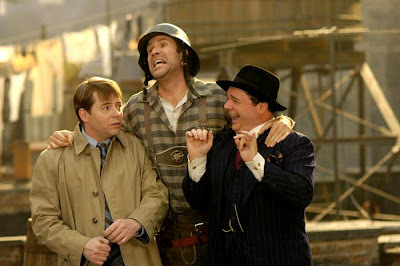 The Producers is a travesty; a shambolic, overblown and pointless take on an old classic. Some viewers may watch it in the hope that it will give them a taste of the stage show, but it fails to express any of the exuberance, energy or joy which the theatre production generated. This hollow and cynical imitation has nothing new to offer and a cash register where its heart should be. It’s one of the worst films of the year and, despite all the noise and bluster on display, it’s also the laziest.